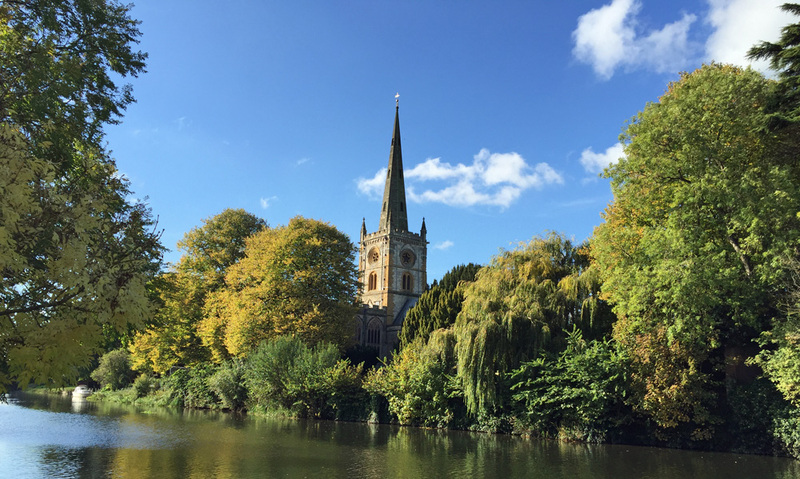 The famous cathedral in Stratford – aka The Royal Shakespeare Company’s recently extended and reconfigured building – sits majestically at the side of the River Avon. It doesn’t quite have the easy elegance displayed by real cathedrals (York Minster for example) but it has a restrained simplicity, offset by the austere brickwork so common of buildings of the post-WW1 era. Following a fire in the 1920s, a competition was held to choose the designer for the new theatre. In January 1928, following an open competition, 29-year-old Elisabeth Scott was unanimously appointed architect for the new theatre which became the first important work erected in the United Kingdom from the designs of a woman architect. George Bernard Shaw commented that her design was the only one that showed any theatre sense. Although the theatre served well for 80 years, finally a £100m+ refurbishment started in 2008 when the building closed for four years, the company moving to a temporary space up the road. 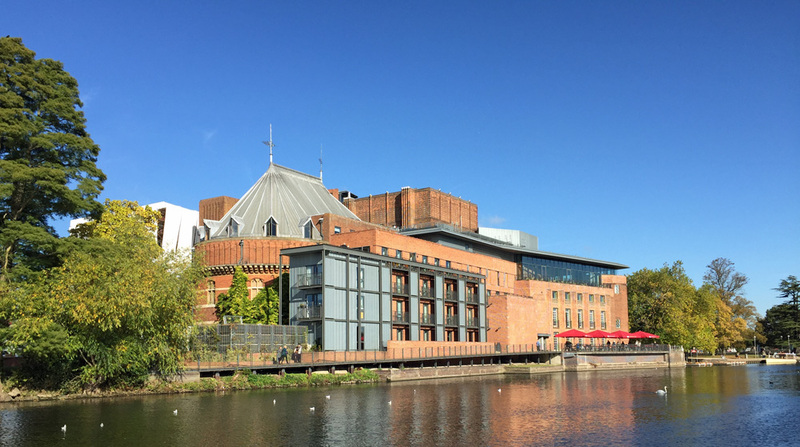 Closing wasn’t an option, nor moving elsewhere (London, for example) as the RSC believe they contribute over £75m every year into the local economy. So, architects Bennetts Associates‘ design has maintained the successful elements of Scott’s buildings, while making substantial improvements to the auditoria, backstage and public areas. The furthest seats are now only 15m away from the stage, rather than 27m in the Scott design, and the auditorium now holds well over a thousand dedicated aficionados [though we always see someone “resting their eyes”]. Externally, the red brick and detailing of Scott’s river front is retained, but extended with a two-storey glazed extension above, and the polygonal ‘curve’ of the auditorium visible above in steel cladding. All in all, a great improvement both to the rather severe building and to the facilities. The redesign avoids the easy trap of applying too much in the way of contemporary trappings, instead opting for restrained timelessness. Whew. 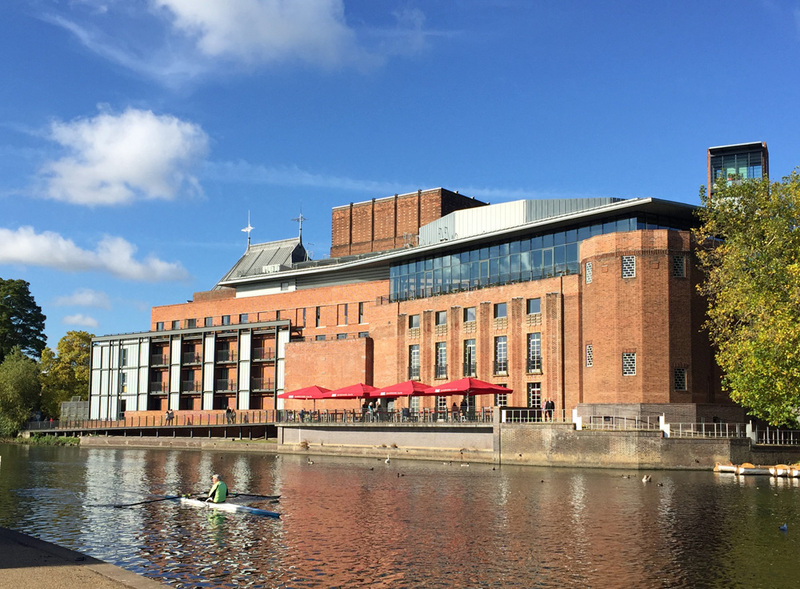 This time it was to see Henry V, the last in the trilogy put on this year – we saw Henry IV Part One in Newcastle, as part of the RSC’s tour of the provinces, but missed the middle episode. A full house of course, playing to the 1,000 people that the reconfigured main theatre can hold, and nearly every seat has a good view. We took in a backstage tour, a really interesting use of an hour. The washing machines, wow…! 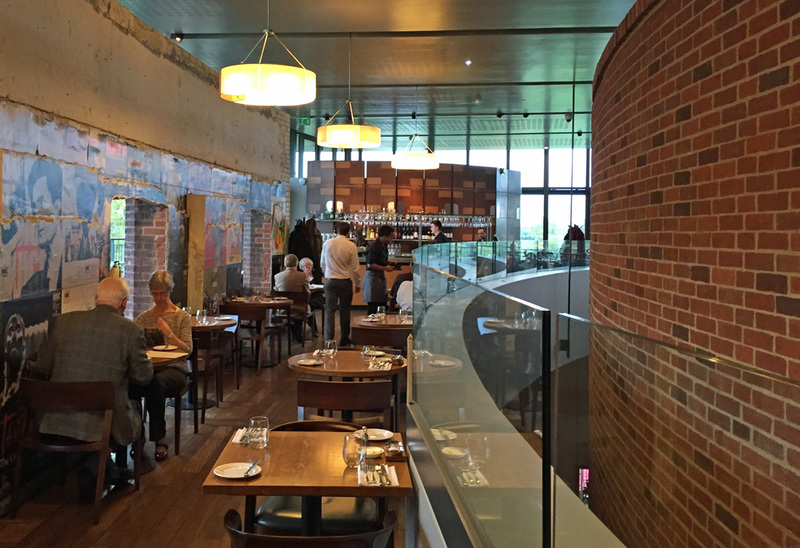 Part of the refurbishment included the creation of a new rooftop restaurant and it was here we ate before the performance. 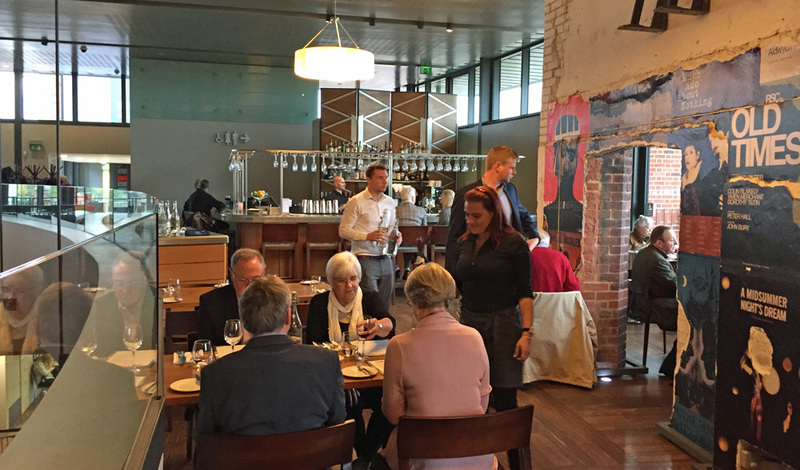 The food is good, and good value with two courses for £19.95 and three for £24.75. Simple, easy to prepare and serve, the food hit the spot – we even managed a pud [well, some of us], and a nice inexpensive bottle of sauvignon blanc/viognier blend – why hasn’t anybody done that before? – richness of the viognier with the freshness of the sauvignon. Based on getting people to their seats in time for the performance, the service could be described as brisk – not quite enough time to lick the plates before being whisked away. Still, a good place to enjoy the build up of the atmosphere and support the RSC.